Artie Lange joined the Howard Stern Show cast in 2001 as a replacement for Jackie Martling. The baby gorilla was an instant hit with fans, which is why his first book was such a success. Lange’s first book, Too Fat To Fish (co-written with journalist Anthony Bozza), is 320 pages of laugh-out-loud hilarity! Before his downward career spiral, the beloved former Stern Show cast member wrote one of the funniest books listed on this site. Too Fat To Fish is a chronological collection of memoirs told by a modern day raconteur. It details Lange’s childhood growing up in working-class Italian family in Union, New Jersey. Be warned, there are also some dark stories mixed in with the hilarious ones. Artie goes in depth about his father, who became a quadriplegic after an accident when Artie was eighteen (he died soon after). After the death of his father, Artie worked a number of odd jobs before diving into comedy. He writes some of the stories he encountered along the way. Lange also discusses his drug addiction, describing his coked-fueled days working on the sketch comedy television show MADtv and doing stand-up comedy. Is there an audio version of the Too Fat To Fish book? Who did Artie dedicate his first book to? YES! 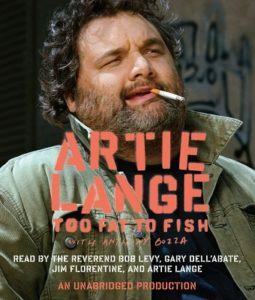 As Stern Show cast members Sal and Richard have demonstrated over the years, there is indeed an audio version of Artie’s first book. And yes, Artie does indeed narrate this one, because we all know Artie’s gonna do what Artie’s gonna do. Fans can download an audio version of Too Fat To Fish on Audible. The book Too Fat To Fish was dedicated to Howard Stern, whom also wrote to forward to the book.